Public can access the mill’s bastion freely all year long, it offers great views of the maritime plain and the Audomarois region. The other bastions are not accessible to the public, but are visible from the outside. Signage and information panels along the trail “Sentier de la Montagne” (connecting the fortification to the city) allow visitors to understand the history of the site and landscape. The French had just taken Watten back to the Spaniards, in order to attack Saint-Omer. The operation failed and Watten fell into the hands of the Spaniards in June of the same year, who built a flood barrier dyke in the valley between Watten and Eperlecques and flooded the Audomarois marshes all the way to Saint-Omer. 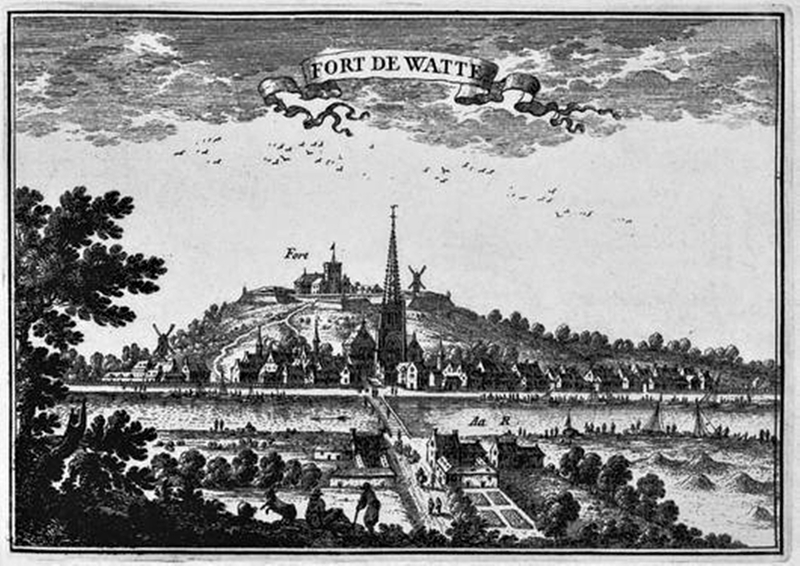 In 1644, Watten returned to the hands of the French, and the young king Louis XIV commissioned the engineer LE CAMUS to establish a fortification in order to shelter the troops during winter. Dutch contractors were brought in to build uncovered earthen fortifications. Ditches and moats were dug, bastions were established by tamping the earth without covering the ramparts with masonry. Small forts protect the dam, the lock or the second mill near Wattendam. The fortification is designed to accommodate up to 10,000 men. It consists of 5 bastions connected to each other by a walkway. A path connects Watten Fort, above, with Fort du Bourg, below. The Fort will be abandoned two years later, as it has become useless when the battle line moved to the north. A year after its abandonment, the fort is taken over again by the Spaniards who destroy the fortifications. In 1677, the French drive the Spaniards out from Watten and restore the fortifications. Watten becomes French once and for all, one year later, by the Treaty of Nijmegen.